WS staff tend to pax in medical emergency. It shouldn’t be a ‘Deviation’ when an airline goes a good job, but after a week of United Airlines being excoriated in the media for its treatment of a paying passenger – and the failings of other carriers exposed too – it’s nice to remember that airlines get it right sometimes. 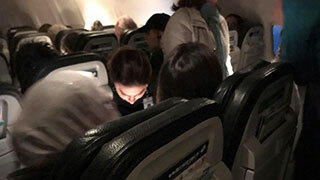 In this case it is WestJet, praised by a U.S. traveller for its “organized, caring, respectful and attentive” response following an on-board medical emergency. Joel VanderHoek, a businessman from Lynden, Wash., published an open letter on Facebook praising WS staff for coming to the aid of a male pax who lost consciousness aboard a flight from YYC to YXX last Saturday. Tonight on Flight 105 from Calgary to Abbotsford, something happened that should be shared with you. There was a medical incident, and the way it was handled deserves commendation. Early in our flight, a man sitting near me stood from his seat. All seemed normal until he flopped to the floor in the aisle, the woman in the seat next to mine breaking his fall as she tried to catch him. A loud thump, and it was clear that he wasn't immediately awake or alert. As the woman scrambled to attend to him, I pressed the call button a few times to alert the flight crew. The women in the flight crew (Lori and a few others) all quickly made their way over to help. They were so organized, caring, respectful and attentive. Medical assistance was requested over the intercom, followed shortly by a call for a Punjabi translator. Your flight crew worked alongside a nurse who was onboard, and a young woman helped translate as needed. The man awoke and was helped up into his seat. They kept the man's sister who was travelling with him comfortable and apprised of the situation, as they asked her questions to help determine the cause of his passing out. It was beautiful to see strangers come together as humanity to help one another. Meanwhile another nurse and another translator volunteered and stood by just in case. Your flight crew continued to coordinate an organized and informed response as the man recovered and ultimately was determined to likely have fainted for unknown causes. In an Easter week of particularly unpleasant news about airline treatment of customers, I commend you for a culture of kindness and care. It was evident before the medical incident but was made especially clear tonight. Thank you. VanderHoek’s Facebook post has earned over 90,000 reactions and been shared over 17,000 times, proving that good news can go viral too.